Who doesn’t love books by Author, Abby Vandiver? “A Tiny Collierville Murder” is no exception. Her quirky characters, her writing style and now a tiny house series. I love tiny houses so a series with tiny houses as a feature in this cozy mystery series make it a winner. Add to the fact that it holds twists, turns and surprises you won’t expect along with a great cozy mystery. I don’t want to give away any secrets so read the blurb for information. I give it five stars and as always I can’t wait to read more of Abby Vandiver’s books. There’s nothing tiny about murder! Watch Tiny House on HGTV? Well, some of those miniature abodes are built on the Carter Ranch in Collierville, Tennessee, or so Nixie Culpepper has just been told, and she thinks they are just the cutest things! But her excitement is short lived when, not long after she lands at the ranch, she gets embroiled in a murder! Nixie, a polyglot and black belt martial artist, is also addicted to designer wear. And while she can protect herself, and her little furry mixed-breed, Alfie, from danger, her credit cards are always being assaulted. She’s got a Japanese paternal grandmother who wants to be a YouTube star, and a Yugoslavian maternal grandfather who not only thinks he’s royalty, but loves Elvis, has an arsenal of corny jokes, and corresponds with Nixie regularly on FaceTime. But the murder of Big Willie Carter puts a halt to everything, and it’s up to Nixie to find out whodunit if she wants to leave Collierville and get back home to Connors Grove, New York with her brand new tiny house. A fun new cozy series with Nixie Culpepper traveling the country with her dog and tiny house in tow. WALL STREET JOURNAL BESTSELLING AUTHOR, Abby L. Vandiver has always loved to write, combining that with her gift for telling stories, and mystery she became an author. All of her books have been Amazon #1 bestsellers. Her debut novel, In the Beginning and its sequels, Irrefutable Proof and Incarnate are fact mixed with fiction, mystery/sci-fi novels not written as action packed or fast paced, but as “what-if” alternative history stories. After those books were published, Abby switched to writing cozy mysteries. 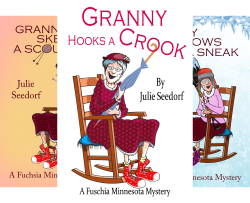 Finding much success, she has three series so far, Logan Dickerson Cozy Mystery, Normal Junction Cozy Mystery and Tiny House Mysteries. In 2017, she contracted with Henery Press in a 3-book deal to pen the series Romaine Wilder Mysteries. The first book, Secrets, Lies and Crawfish Pies comes out in June, 2018. Although she writes mostly mystery, Abby has co-written a historical/women’s fiction novel with author and friend, Kathryn Dionne under the pen name Kathryn Longino, and a Kindle World, historical fiction book, Countdown to Atlantis. That book was inspired by the A.G. Riddle book, The Atlantis Gene. Abby, a former lawyer and college professor, has a bachelor’s degree in Economics, a master’s in Public Administration, and a Juris Doctor. A lifetime resident of Cleveland, Ohio, Abby spends all of her time writing and enjoying her wonderful grandchildren. Abby’s got many more books to come, so stay tuned! All her books are wonderful. All her books are a good read. Thank you Lisa Kelly. They certainly are.